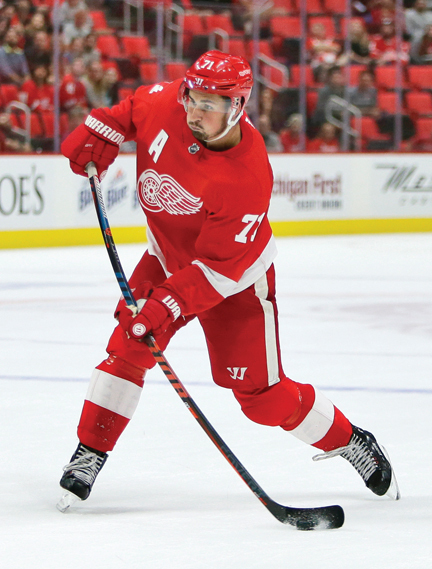 DETROIT — Dylan Larkin has suddenly become a veteran at the age of 22 for the Detroit Red Wings. The rebuilding Red Wings are desperately hoping the talented, two-way center can quickly become a leader on and off the ice. They suffered a setback before the season even started when captain Henrik Zetterberg’s back injury ended his career. Larkin is likely the one player who can come closest to filling the void this season. He signed a $30.5 million, five-year deal last summer after leading the team with career highs in assists (47) and points (63) in his third season. Detroit did not make the playoffs last year for the second straight year after earning a spot in the postseason 25 straight times. A lot will have to go right for the Red Wings to avoid missing out on the playoffs again, a three-year drought that would be their longest since 1979-83. Hall of Famer Steve Yzerman led the franchise’s resurgence after being named captain in 1986 at the age of 21 until his retirement in 2006. Hall of Famer Nicklas Lidstrom then wore the ‘C’ for the next several seasons before ending his career and starting Zetterberg’s run as captain. While Larkin seems like a likely candidate to become the next captain, he may have to wait. Detroit is retooling around a trio of promising, young forwards: Larkin, Anthony Mantha and Andreas Athanasiou. All three signed multiyear contract last summer. Filip Zadina may not make an impact in the NHL right away, but teammates say the Czech winger taken No. 6 overall this year won’t take long. “You can tell how he handles the puck and skates that he’s going to be something special,” Kronwall said. Defense appears to be the weakest part of the team. The back end is led by the 37-year-old Kronwall and Trevor Daley. Mike Green is expected to miss the season-opening game and it out indefinitely with a virus. Green signed a two-year contract worth $10-plus million after he had a season-ending surgery on his spine last spring. Detroit appears to have a solid tandem in goal: Jimmy Howard and Jonathan Bernier. Howard, who made his Red Wings debut nearly 13 years ago, was 22-27-9 last season with a 2.85 goals-against average. He may not have to play 60 games again because Bernier has 10 years of experience and played in at least 37 games the previous three years for three teams: Colorado, Anaheim and Toronto. Coach Jeff Blashill enters the final year of his contract with a 104-105-37 record over three years.